With the development of infrastructure, the demand of artificial sand aggregate continues to increase. Pebble, granite, basalt, limestone and other materials to become the main raw materials to make sand. Pebble has large reserve, and the final sand meet the requirements of national construction sand, which has driven the rise of pebble sand making equipment. Pebble hardness is about 7, most manufacturers will choose jaw crusher + cone crusher to crush the large pebble, and then use sand making machine to get the final sand. 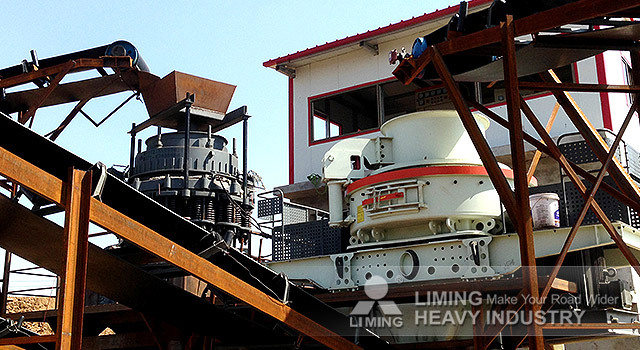 Liming Heavy Industry configured hydraulic cone crusher for pebble and other high hardness materials. The cone crusher is crushed by a laminated crushing method, which greatly improve the crushing ratio and production, and also minimize the loss of wearing parts, to extend the life of the machine. In addition, the complete sand production line includes feeder, jaw crusher, VSI5X sand making machine, conveyor, vibrating screen, sand washing machine and other machine. If you have any need, please contact with our online service!